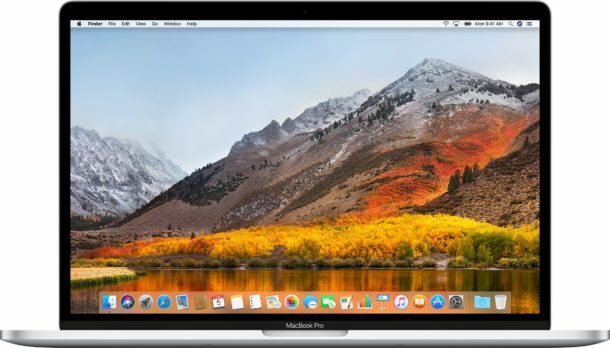 Apple has released macOS High Sierra 10.13.6 to Mac users running the macOS High Sierra operating system. The software update is said to include various bug fixes and security enhancements. Additionally, Mac users running Mac OS X El Capitan 10.11.6 or macOS Sierra 10.12.6 will find security updates available on those machines, along with a minor update to Safari. Separately, Apple has also released iOS 11.4.1 update for iPhone and iPad, along with software updates for the Apple Watch, Apple TV, and HomePod. Mac users running macOS High Sierra can find the macOS High Sierra 10.13.6 update available now from the Mac App Store Updates section. El Capitan and Sierra will instead find Security Update 2018-004 available as a download to install, along with Safari 11.1.2. Always backup a Mac before installing any system software update. If you are currently running macOS Mojave public beta or another version of macOS then you will not find these updates available to you. Again, be sure to backup the Mac before installing any software update or security update. The macOS High Sierra 10.13.6 Update adds AirPlay 2 multiroom audio support for iTunes and improves the stability and security of your Mac. This update is recommended for all users. – Control your home audio system and AirPlay 2-enabled speakers throughout your house. – Play music at the same time on multiple AirPlay 2-enabled speakers in your house, all in sync. – Fixes an issue that may prevent Photos from recognizing AVCHD media from some cameras. – Fixes an issue that may prevent Mail users from moving a message from Gmail to another account. Apple also released iOS 11.4.1 for iPhone and iPad alongside minor software updates for the Apple Watch, the Apple TV, and the HomePod Siri speaker. I made several attempts to do this update last night and this morning, every time it dl but then upon restart freezes my MBP and mini. DO NOT DO THIS UPDATE, IT IS CORRUPTED!!!! Sorry to hear you are having problems with installing this update onto your Macs. Often that can remedy a failed update, or work when another update method fails. As always, back up your Mac completely before installing any software updates. This update is flawed, my MBP and Mini both freeze on reboot to install this on multiple attempts. DO NOT DO THIS UPDATE UNTIL APPLE FIXES IT!!!!! I run the update normally, machine works fine. I guess during your download process internet fail and damage your setup file. No problems here, everything run perfect. I hope you can fix its asap. Yeah, I updated without incident too. Hope you backed up. Installed fine ( although it took a lot longer then usual ) on my 13,3 MBP. Also installed properly on my MacPro 3,1 running the ‘macOS High Sierra Patcher Tool’, thankfully Nvidia had a new pascal driver update already available today! Installed fine on my macbook pro. No need for alarm. Failed the download a few times, the files was so huge. Everything was fine as usual when I rebooted. Apple should have advised to backup prior to installing the new operating system update, I shall remember next time. Hate being controlled by big enterprises. Run a time machine backup in the future, you’ll always be backed up. You should be doing this anyway – it has nothing to do with being controlled by big business, it’s just common sense. Apple shouldn’t have to advise to backup, it is basic common sense. No one is controlling you other than yourself. If you are not backing up prior to any updates and regularly, the one and only one to blame is yourself. Installed update on MacBook Pro with no problems. I echo comment on Time Machine Backup. Nothing to worry about. Is the issue with dual displays(not mirroring) not being detected fixed yet? Who cares? What’s a computer?? Apple is working on a morning show TV program starring Reese Witherspoon and Jennifer Aniston!!! After the update, no mailcontent, no apple store content, safari prefs crashes safari, etc. Anybody else with Mail issues on MBP? Some accounts suddenly don’t recognize the password any longer and even reentering the password is not accepted. On iPhone they are still fine. I have a dual boot setup on my 2015 macbook air. I run Centos Linux and a heavily modified version of mac OS-X Yosemite. I long disabled many of the built in functionality, and replaced many of the built in apps with third party apps I physically removed the web camera and microphones (I am not a web camera user). The computer has almost no identity as a macbook. I accidentally downloaded the “High Sierra” update. It is now sitting on the hard drive. What happens if I install it? Hi, updated (about 15 minutes), today my MBPr 13 Mid 2014. Everything went fine, and all seems to be operating correctly. I’ve been using 10.13.6 since it was released. Couple weeks ago it started freezing every couple of days, now it’s every couple of hours. I usually use google drive, docs, and R, the stats software. I’ve got lots of RAM, SSD, CPU. I’ve tried the usual remedies, reset PRAM etc. Wonder what it is? 2016 MBP tried twice and crashed it and had to reinstall OS. There are other forums that people are experiencing the same failure. Some suggested to boot into recovery and select your boot disk then restart. I will wait until Apple fixes before I try again, wasted over an hour two nights in a row now. After i have updated to 10.13.6, my internal sound speakers are not showing up.